The arrival of autumn brings bright leaves, crisp air and a cornucopia of things to do in Madison, WI! We are fanatic about fall, from Badger footballgames to the harvest at the Dane County Farmers’ Market and leisurelylakeside strolls under a canopy of colorful leaves. Keep reading to learn more about what’s new this season in Greater Madison. USA Today just recognized the Dane County Farmers’ Market as one of America’s most historic markets. Indeed, we have earned a reputation over the years for the size of our market, which winds all the way around the Capitol Square—and offers a chance to chat with local farmers. Many chefs shop the market for farm-to-table menu items that change with what’s in season, so there are always new flavors to try. 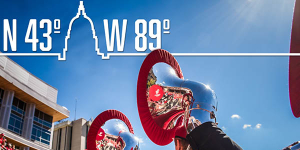 Madison is ranked America’s #1 Best College Football Town, but there are many other reasons to visit this fall! Unlock all of the colorful adventures and plan your trip today! Looking for kid-friendly fall fun? Introduce them to farm life at Schuster’s Playtime Farm, where there’s a brand-new themed corn maze each year (hint: elect to come in 2016 and you won’t be disappointed!). Or visit Eplegaarden, featuring “selv plukk” (pick-your-own) orchards and horse-drawn hayrides. Both provide a blend of nature, agriculture and old-fashioned fun! Attending a Badger football game is a must when you visit Madison in fall! We are ranked repeatedly as a top college town by media ranging from BBC to USA Today, and offer an array of spectator sports for men’s and women’s teams. Before you go, read our Game Day itinerary which features tips about pre- and post-game activities. This year, the Madison Capitols start their hockey season in September. This junior hockey league showcases players 20-years-old and younger and is a feeder system for NCAA Division I teams. Sports fans should also check out theMadison Area Sports Commission, which brings many diverse sporting events to the area, including Ironman Wisconsin in September. Madison is home to a variety of food festivals in the fall, including the Taste of Madison, a celebration of food and live music around the Capitol Square, and Pie Palooza, a savory combination of Wisconsin-grown ingredients and all things pie. Of course, beer festivals abound, including the annual Isthmus OktoBEERfest, featuring more than 40 craft brewers and artisan sausage and cheese makers, and the Thirsty Troll Brew Fest in nearby Mount Horeb.